​Lisbon / Madrid – 29 June 2017 – According to a new WWF report, 82% of shrimp exported by Mozambique goes to the EU, mainly to Spain and Portugal. But although Mozambique’s shrimp stocks have historically been plentiful, they are now threatened. WWF is calling on European consumers, especially in the Iberian peninsula, to make informed choices – and to help support the improved management the shrimp fisheries urgently need. If not, the continued availability – and even the survival – of the species is by no means certain. Lisbon / Madrid – 29 June 2017 – According to a new WWF report, 82% of shrimp exported by Mozambique goes to the EU, mainly to Spain and Portugal. But although Mozambique’s shrimp stocks have historically been plentiful, they are now threatened. WWF is calling on European consumers, especially in the Iberian peninsula, to make informed choices – and to help support the improved management the shrimp fisheries urgently need. If not, the continued availability – and even the survival – of the species is by no means certain. “When we buy shrimp from Mozambique in Portugal or Spain, we influence an entire chain which leads back to some 850,000 local households (20% of the population) who rely on fisheries for their income or subsistence,” says Angela Morgado, Acting Manager for WWF in Portugal. 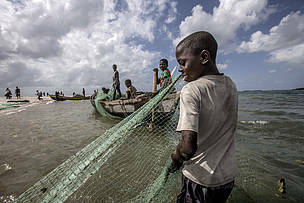 According to WWF’s report Mozambique: building a sustainable shrimp fishery - How EU consumers, corporates and authorities can improve social, environmental and economic conditions in the developing world, the Mozambique shrimp catch has fallen significantly in the last decade, and some stocks are now on the point of collapse. There are several reasons behind this. First, stocks are being fished unsustainably by everyone involved. Beach-based artisanal fishers catch juvenile shrimp before they can reproduce; while in deeper water the heavy trawl gear used by industrial vessels is posing an increasing risk to shrimp habitats, magnifying the impact of overfishing. Second, Illegal, unreported and unregulated (IUU) fishing costs Mozambique $36-67 million each year, and makes existing stocks very hard to monitor and manage. Third, bycatch rates in tropical shrimp trawls are estimated to be as high as 85%, which can devastate ecosystems – but fishers are resistant to change as they fear less bycatch in nets would also mean fewer shrimp. “What’s more, Mozambique ranks third among African countries most vulnerable to climate change; and it’s developing fast but with widespread pollution and habitat destruction – including of mangroves, vital nurseries for shrimp. All in all we have the perfect equation for the species to disappear,” adds Angela Morgado. It’s still possible to put Mozambique’s shrimp fishery on a sustainable footing offering improved yields, reduced impacts on the marine environment, higher margins and long-term security – but this will require collaboration and commitment from all involved, and an effective management and control regime. On their side Portuguese/Spanish consumers and corporates could significantly influence the situation in Mozambique by demanding sustainable shrimp. Consumers should look for shrimp certified by the MSC or ASC, or check the WWF seafood guide (guiapescado.wwf.pt). “If demand keeps growing and the fishery is not well monitored, the consequences could be devastating. Mozambique’s shrimp exports are of great importance to the local and regional economy, especially to coastal communities. Efforts are being made to improve the fishery, but there’s a long way to go. Ultimately, things will change only if we all make conscious choices to strengthen the future of the oceans and their resources, from the sea to our plate. One of the best ways of doing this is to support sustainable production in developing countries,” concludes Angela Morgado. The report “Mozambique: building a sustainable shrimp fishery - How EU consumers, corporates and authorities can improve social, environmental and economic conditions in the developing world” is part of the WWF project Fish Forward. The project was launched in 11 member states of the European Union during the European Year for Development in 2015. Co-financed by the EU, it aims to promote more environmental, social and economic sustainability in fish and seafood consumption. The project aims to increase consumer awareness of the global ecological and social consequences their fish consumption has – particularly given the current extent of global overfishing. To encourage and empower consumers to make the right choices when buying seafood this project launched the new WWF seafood guides in different languages. Fishermen gather seine nets from the water on the Ilha de Mafamede, Mozambique.